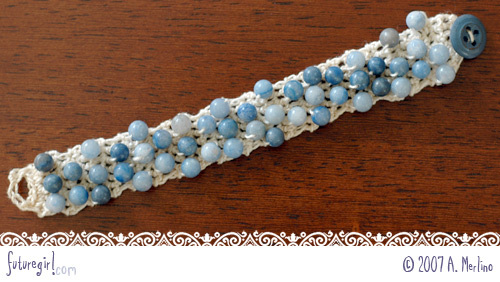 I've found another use for my crochet cotton thread - a beaded bracelet. It's great for summer, when you might be getting sweaty, dirty, or jumping in the pool (sea, lake, whatever), because it's washable - so you don't even have to take it off. This pattern could easily be changed to be an anklet or choker. It's a simple single crochet, so you can add stitches to make it wider and rows to make it longer. I used beads for my bracelet, but you can use anything you can string on the thread: beads, buttons, sequins ... use your imagination *and* your stash. 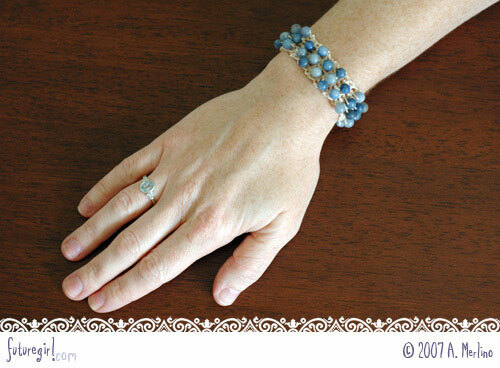 I reserve the copyright on the pattern and the instructions (which means you can't reprint this anywhere), but feel free to make all the bracelets you want and do anything you want with them (yep, you can sell them). If you make a bracelet, let me know. I'd love to see it! 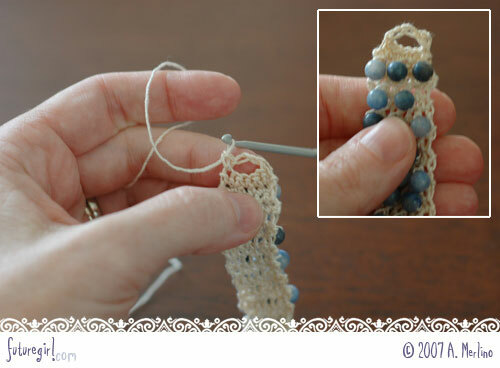 *Bead Single Crochet: (bsc): Do a normal single crochet, except after you put your hook through the stitch in the previous row, pull a bead up to your hook and then yarn over using the crochet cotton thread on the far side of the bead. Then pull the loop through the stitch in the previous row. 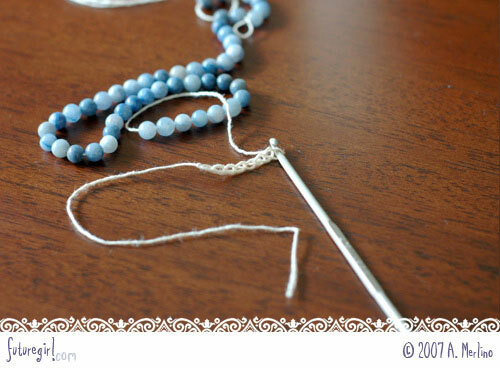 You will now have two loops on the hook and the bead will be looped against the piece. Yarn over and pull through both loops to complete the single crochet. 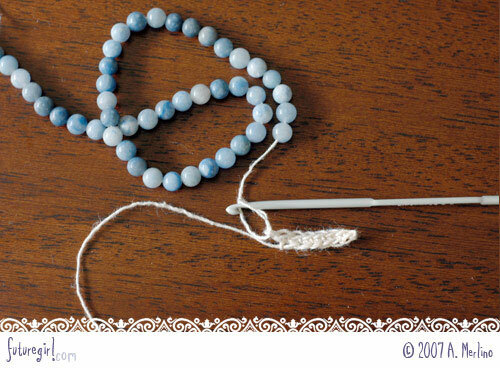 · Thread 48 beads on crochet cotton thread. 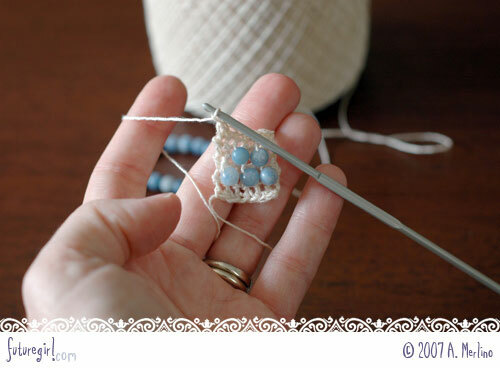 · ch 7, leaving about 10" of crochet cotton thread before the start of the chain. · Row 1 - Starting with 2nd ch from hook, sc in each of the next 6 ch, ch 1, turn. · Row 2 - sc in each stitch across (total 6), ch 1, turn. · Row 3 - sc in each stitch across (total 6), ch 1, turn. · Row 4 - sc, bsc, sc, bsc, sc, bsc, ch 1, turn. · Row 5 - sc in each stitch across (total 6), ch 1, turn. · Row 6 - 2 sc, bsc, sc, bsc, sc, ch 1, turn. 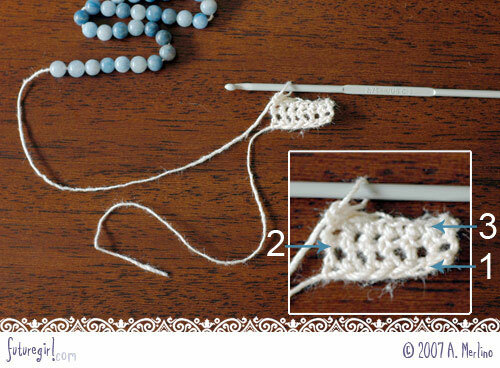 · Row 7 - repeat Rows 3-6 until you've used all the beads. · Last Row - sc in each stitch across (total 6), ch 3, turn. · Button Hole - skip 5 stitches, sc in last stitch of previous row, finish off, weave in end. 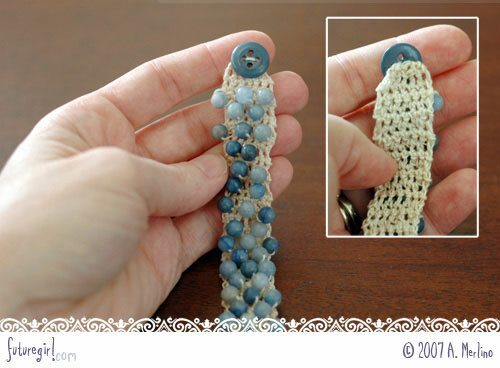 · Attach button with 10" thread at beginning of bracelet and weave in end. 1) Thread 48 beads on crochet cotton thread. I bought sky quartz beads. They were $6 for two packs of 24. When you're stringing your beads, count them two times, and then count them again. 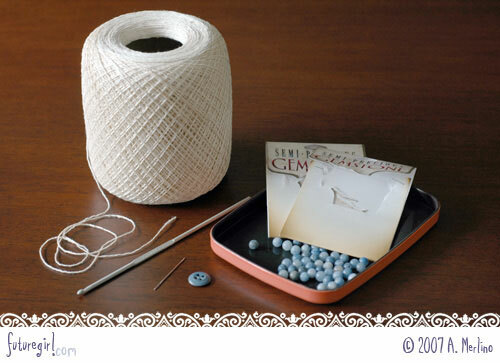 All of the beads must be on the thread before you start, so it pays to make sure they are all there. I used the big-eyed needle to thread them on. 2) Chain 7. Leave about 10 inches of thread before you start crocheting. This will be used to attach the button later. I'm a tight crocheter. I've found I need to make these chains extra tight or else the first row is much wider than the rest of the rows. Usually I don't have to worry about this, but I do with the crochet cotton thread. 3) Row 1 - Starting in the 2nd chain from the hook, single crochet in each of the next 6 chains (total 6 single crochet), chain 1, turn. 4) Row 2 & 3 - Single crochet in each stitch across (total 6 single crochet), chain 1, turn. 5) Row 4 - Single crochet, bead single crochet, single crochet, bead single crochet, single crochet, bead single crochet, chain 1, turn. 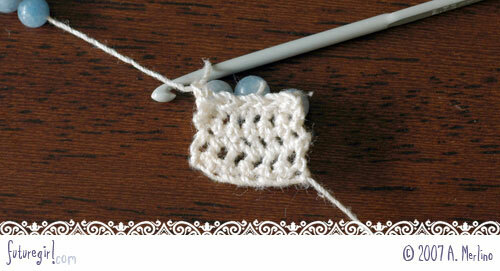 Below are photos of the bead single crochet (bsc). 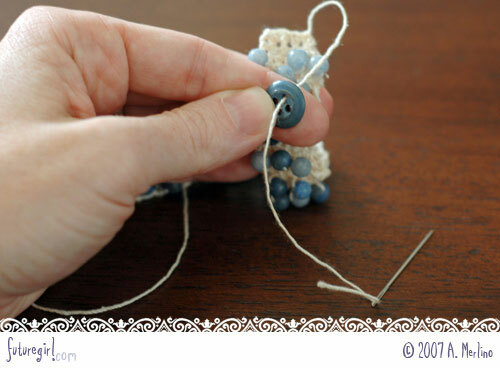 [A] put hook in the stitch of the previous row and pull a bead up to the hook. [B] Yarn over using the thread on the far side of the bead. [C] Complete the single crochet as normal. 6) This is the completed Row 4. You may be wondering why the beads aren't centered on the bracelet. 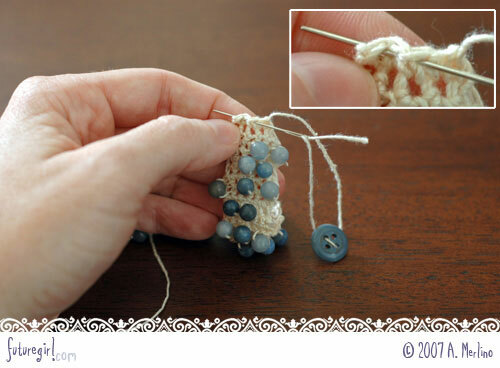 I found that if I had a five-stitch-wide bracelet and I put a bead on stitch one, three, and five, that the first bead looked like it was hanging off the edge of the bracelet. The way the bead is secured by a diagonal thread makes it lay to the right a little. That's why I added a stitch before the first bead. 7) Row 5 - Single crochet in each stitch across (total 6 single crochet), chain 1, turn. While you crochet this row, the beads are facing you. 8) Row 6 - single crochet, single crochet, bead single crochet, single crochet, bead single crochet, single crochet, chain 1, turn. This row only has two beads and they are offset from the beads in the three-bead rows to create a pattern. 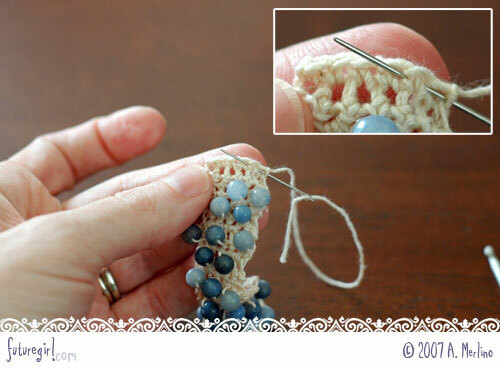 You could change when you make the bead stitches to create a different pattern if you want. 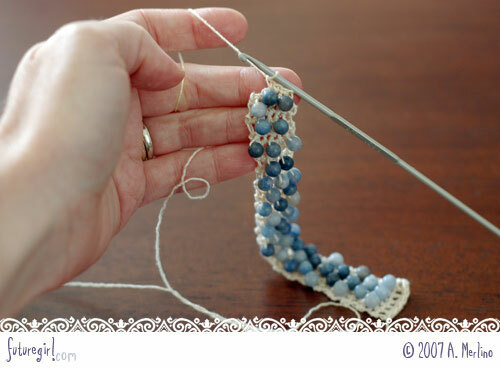 9) Repeat Rows 3, 4, 5, 6 until you've used all the beads. Below is what your bracelet will look like after your first repeat of Row 3. 10) Last Row - Single crochet in each stitch across (total 6 single crochet), chain 3, turn. 11) Button Hole - skip 5 stitches, single crochet in last stitch of previous row. You might want to wait to finish off your bracelet until you can test if the button hole is big enough for your button. If it's too big or too small, adjust the number of chains. 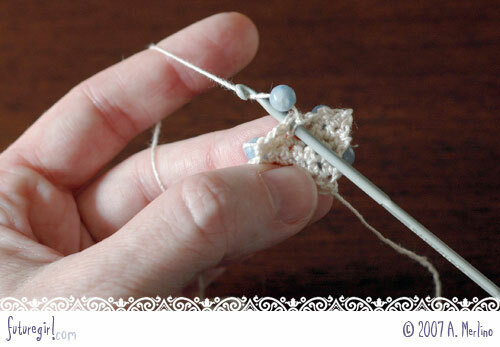 The important part is that your chain starts at one corner and your single crochet is at the other corner. This makes a clean edge with no poky or floppy bracelet corners. To finish off, make a chain and pull through a big loop. Cut the loop and pull the cut end completely through the last chain. Pull tightly. 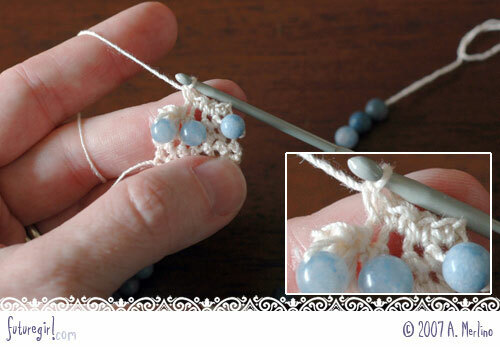 Use the needle to weave the end into the bracelet. Trim off any extra thread. 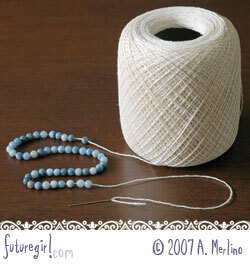 12) You are going to attach the button using the 10-inch tail of thread you left at the beginning of your bracelet. Use the needle to weave in the spaces between the stitches of the first row. First come from the back to the front in the first space, from the front to the back in the second space, and then from the back to the front in the third space. Your needle will now be coming up in the space just to the right of the middle of the bracelet. 13) Pull the thread tight to gather the stitches together, then thread the button by coming from behind to the front. 14) Next, go through the button from the front to the back. Thread the needle through the spaces of the rest of the row just like you did the first half of the row. 15) Pull the thread tight to gather all the stitches. This will make a clean edge free of poky, floppy corners on this end, too. 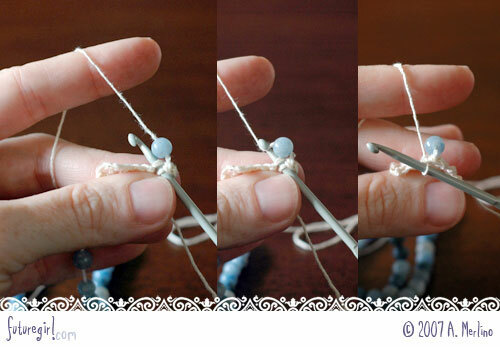 Make a knot (just like a normal embroidery knot: half-way insert the needle behind a thread in the bracelet, wrap the thread from the needle around the needle twice, pull the needle through the wrapped thread). Weave in the end and trim the excess thread. 16) That's it! You're done.